North American willows form a large and diverse family of both native and imported trees. In fact, many of the over 75 varieties found in the United States and Canada are more bush or shrub than tree and some reach a height of no more than a few inches. All willows have light, soft wood, bitter bark, and cap-like winter buds. 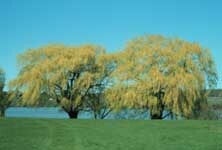 For landscape plantings, one of the most popular willows has long been an imported variety, the weeping willow. Learn more about the different types of willow and the insects and diseases that affect them.